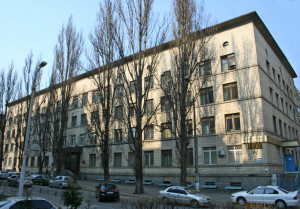 Institute of Engineering Thermophysics of NAS of Ukraine. Mailing address: 2a, Zhelyabova Str., Kyiv, 03057, Ukraine. Institute of Engineering Thermophysics of NAS of Ukraine was founded in 1947 on the basis of the Institute of Energy of the Academy of Sciences of the Ukranian SSR. The original name was “Institute of Heat and Power Engineering”, after reorganization in 1964 it was Institute of Engineering Thermophysics of the Academy of Sciences of the Ukranian SSR (hereinafter – the Institute). Institute of Heat and Power Engineering was carrying out the research on the improvement of heat engines, the intensification of heat transfer processes in different technical devices and the research on the energy-technological using Ukrainian’s brown coal. Then the Institute began working in new scientific directions such as: high-rate heat and mass transfer, mining thermophysics, measurement of heat processes, thermoprotection of high-temperature devices. the theory of measurement of thermal characteristics, the creation of new thermophysical tools and systems for monitoring the state of technical objects and technologies. In different years, the Institute’s scientific staff was headed by famous scientists: Academician of the Academy of Sciences of Ukrainian SSR I.T. Shvets, Professor G.M. Shchegolev, Academician of the Academy of Sciences of Ukrainian SSR V.I. Tolubinsky, Professor G.L. Babukha, Corresponding Member of the Academy of Sciences of Ukraine O.A. Gerashchenko., Academician of NAS of Ukraine A.A. Dolinsky managed the work of the Institute from 1982 to 2015. Now he is Honorary Head of the Institute. Since December 2015, the Institute is headed by Yu.F. Snezhkin, Corresponding Member of the NAS of Ukraine, Doctor of Engineering, Professor. Academicians the Academy of Sciences of Ukrainian O.N. Shcherban, O.O. Kremniov, Ye.P. Dyban belong to famous scientists who worked at the Institute. At present, the Institute employs about 400 people, including 3 Academicians of NAS Ukraine (A.A. Dolinsky, A.A. Khalatov, Yu.F. Snezhkin ), 6 Corresponding Members of NAS of Ukraine, 17 doctors and 93 candidates of sciences. There are 12 scientific departments in the structure of the Institute. The Institute has doctorate, postgraduate study and two Doctor and PhD Scientific councils for the defense of dissertations. The Institute since 1979 publishes the international scientific and applied journal “Industrial heat engineering”. The Institute is the organizer of several international scientific conferences. Among them: “Problems of Thermophysics and Heat and Power Engineering”, “Energy from Biomass”, “Problems of ecology and operation of energy facilities”. The IET of NAS of Ukraine has a constantly exhibition of its own developments “Energy and Resource Saving”. The Institute has extensive foreign relations. In different years, it collaborated with scientists and specialists from the USA, China, India, Russia, Germany, France, United Kingdom, Netherlands, Poland, Bulgaria, Czech Republic, Spain, Georgia, Belarus, Kazakhstan, Lithuania, Moldova, Turkey, Vietnam. The Presidium of NAS of Ukraine established the National Committee for Heat and Mass Transfer. It was created on the basis of the Institute of Engineering Thermophysics of the National Academy of Sciences of Ukraine in 1995. The National Association of Ukraine for Heat Pump (Public Organization) was founded on the initiative of the Institute. This was done to popularize using heat pumps and to promote the introduction of heat pump technology. The Institute of Engineering Thermophysics of NAS works in the field of energy, performs work for the industry and agro-industrial sector. It cooperates with NJSC Naftogaz of Ukraine, PJSC “Kyivenergo”, State Enterprise GTRDS “Zorya”-“Mashproekt”, State Design Office “Yuzhnoye” by named M.K. Yangel and other organizations and enterprises. Specialists of the Institute are members and experts of the committees, councils at ministries, departments and state administrations on issues of production, transportation and consumption of energy. The works of scientists of the Institute of Engineering Thermophysics awarded 2 State Prizes of the USSR in the field of science and technology, 12 State Prizes of Ukraine in the field of science and technology, 5 Prizes of the NAS of Ukraine by named G.F. Proskura, 4 Prizes of NAS of Ukraine by named V.I. Tolubinsky, 1 International Prize of the Scientific Committee of NATO, 3 International Prizes by named O.V. Lykov of NAS of Belarus, 2 Prizes of the Academies of Sciences of Ukraine, Belarus and Moldova.